The Oneida Nation uses a Micro Farm 1 from Nelson and Pade, Inc. to grow fresh fish and vegetables for members of the tribe and Oneida School System. The fish and vegetables contribute to healthier food choices and enhanced nutrition. 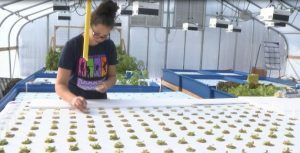 ONEIDA, Wis. (WBAY-TV) Oneida Nation harvested the first fish from its aquaponics system Wednesday. The tribe used a USDA Farm to School Grant to build the program in 2016. Inside the snow covered greenhouse lies a warm environment for Oneida Nation’s aquaponics system. It’s a connected mechanism where food, tanks, pipes, and lights create a system for fish and veggies to grow. There’s about 70 tilapia per tank and it takes about 26 weeks before the fish are ready to be harvested. Oneida Nation is primarily focused on utilizing the lettuce saying, in full production, more than 100 heads of lettuce can be produced a week. “We’re in Wisconsin, winter is a hard one, where not a lot of fresh food is available locally,” said Krenke. The lettuce that is grown is part of the salad bar at Oneida Nation High School. “We would like to see all of our lettuce be utilized at the school and we would like to see the school just purchasing our lettuce,” said Krenke. On Wednesday, veterans from the tribe had fish tacos. Using the lettuce along with the tilapia from the aquaponics system. Nelson and Pade, Inc.® is honored to announce that Rebecca Nelson, co-founder of Nelson and Pade Inc.®, is a featured speaker at Seeds and Chips, the Leading Food Innovation Summit in the World. This prestigious even takes place in Milan, Italy, May 7-10, 2018. Speakers include John Kerry, former US Secretary of State, Howard Schultz, Exec. Chairman of Starbucks, Kerry Kennedy, President, Robert F Kennedy Center for Justice and Human Rights and other prominent individuals with a focus on sustainability in the food and wellness industries. Nelson and Pade, Inc.® will also be an exhibitor at Seeds and Chips, showcasing innovative aquaponic technology, Clear Flow Aquaponic Systems®, training and education programs. Seeds Chips is dedicated to showcasing international talent and cutting-edge solutions from around the world. The 15,000 attendees will meet leading global entrepreneurs, investors and executives building the future of food. Over 200 exhibitors will showcase products and innovations.